Radiohead’s touring company is among four companies under scrutiny by Ontario’s Labour Ministry after a fatal collapse at Toronto’s Downsview Park crushed one man to death and injured three others. The ministry has requested documents from four companies involved with the fatal stage collapse in an attempt to figure out exactly who’s responsible for the fallen structure. In addition to Live Nation, the concert’s organizer and promoter, the ministry has asked for documents from Optex Staging and Services, Nasco Staffing Solutions and Ticker Tape Touring LLP, a company owned by Radiohead. 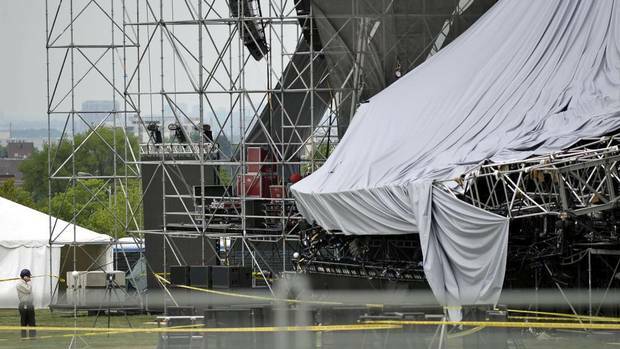 The massive stage crumpled in on itself late Saturday afternoon, killing the band’s drum technician and injuring three other band crew members. Days later, with inspectors and engineers on the scene, the ministry admits investigators still aren’t sure who was responsible for the stage itself. The ministry has asked Live Nation for a detailed plan, signed by an independent engineer, for taking apart what remains of the collapsed stage. A “do not disturb” order remains to keep the accident scene intact. Mr. Blajer said he doesn’t know how long it will take to find out who owns the stage. Documents sought from the other three companies could be anything from permits to engineering specifications and training manuals. Live Nation has declined to comment on the concert, the stage and who is responsible for the site’s set-up and equipment. Nasco Staffing Solutions is an event-staffing company that supplies such positions as riggers, stagehands, audio and lighting technicians. The company has not responded to requests for comment since the accident. A woman who answered the phone Sunday said no Nasco staff were at the Downsview site Saturday. Dale Martin, head of Etobicoke-based Optex Staging, has not responded to queries save for an e-mailed response Sunday that his company is not the owner and operator of the stage in question. Ticker Tape Touring is headquartered on Portland Street in London, England, according to company registry documents. These documents list Radiohead’s band members as sitting on its board. A Radiohead spokeswoman could not immediately confirm Monday what Ticker Tape Tours’ involvement was in setting up Saturday’s stage. “As with any performance, whether it be a theatre or an outdoor show like this, Radiohead installs its production into the performance space as provided by the venue and/or promoter,” the band said in an e-mailed statement. The confusion around the stage’s ownership evinces just how tricky it can be to establish responsibility for a huge, ambitious structure that takes days to set up before being dismantled completely. Last year, the Alberta government laid dozens charges against three companies involved in the 2009 Big Valley Jamboree, when a strong windstorm caused part of the stage to fall and kill a Lloydminster woman. The charges were stayed earlier this year: The Crown cited low probability of conviction.